I spied the back of this house driving around Bendigo and I'm glad we went around the block for a better look. What a beauty it turned out to be. 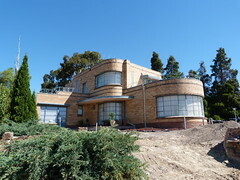 Perhaps not the best surroundings at the moment with a bit of landscaping work going on in the garden and the footpath along the front but a stunning deco home none the less. David is this on Eaglehawk road? I lived in Bendigo for a few years and loved the place. But I don't remember hundreds and hundreds of Deco homes. I wonder what architectural styles were used in and around Bendigo, between a] the end of the gold rush era and b] the post WW2 cream brick veneers. 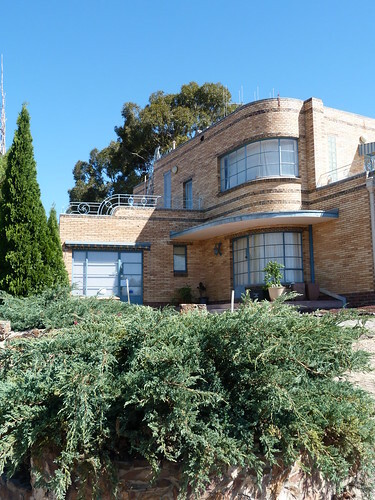 I don't know Bendigo that well Helen but there are a couple of stand-out deco houses and I've seen several others with deco chimneys and other brickwork. It would be interesting to know just how much development there was in Bendigo in that time. I suspect a lot of the city would have been well established by the end of the gold rush. I guess you could describe that as pretty true Australian art deco but it is a little puzzling as to how so much art deco worked its way into country towns, and I wonder what the locals thought about it at the time? Did they decry horrible modern architecture? Good questions Andrew. I'm sure many people did decry this horrible modern architecture. WOW! She's a real beauty. I have visions of building a deco home in the future, and it looks a lot like that! You couldn't go far wrong with something like this. There are some real stand-out inter-war residences along the Calder Highway (formerly High Street), in the Bendigo suburb of Golden Square. 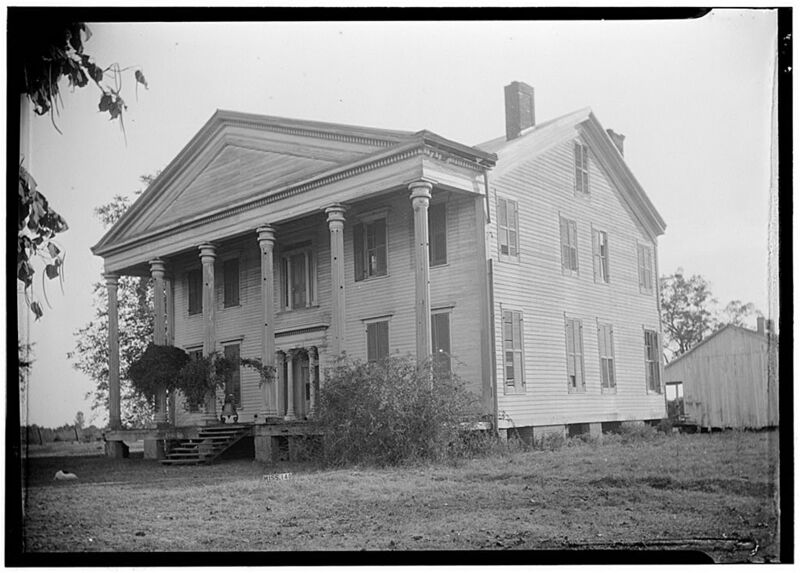 One, I recall, of "Spanish Mission" influence, has a drive-thru porte-cochere supported by barley-twist columns: very sophisticated in its time! Another, which was owned by a soft-drink manufacturing family, is a grand essay in P&O waterfall architecture, all white-painted stucco, curved metal-framed windows, and cascading profiles. There are some real gems tucked away in the town. Thanks skidmark. 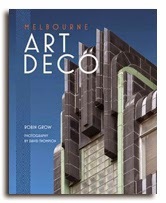 If the deco houses tucked away in Bendigo are anything like this place then they are real gems for sure.